Incense filled the exhibit halls at the National Museum of Mexican Art’s Day of the Dead exhibit opening September 14. The colors of fall covered the room as visitors of all ages walked around to get a glimpse of the art work. Among the art featured was that of David Botello from California. Botello’s painting, called “Nature Wears Her Death Mask,” included a woman at the center adorned with a variety of colorful vines and flowers. The most attractive feature of the painting was the artist’s use of fall’s most fluorescent colors; a quality that generated a lot of attention from visitors. The exhibit also included skeleton skulls adorned in traditional Mexican patterns. The skeleton skulls come to life with their detail and color schemes. There was also an altar dedicated to fallen celebrities like Michael Jackson and Selena Quintanilla. “Soñando con los angelitos” was an altar by David Murga in collaboration with Reid Thompson and Carlos Baldizon. The altar featured various objects that are common in Mexican culture. Amongst those objects was a molinillo which is used to make Mexican hot chocolate. The altar also included cinnamon sticks which are often used to make canela for children who are ill. There was a rosary that brought together the altar, for it represented the strong religious ties in Mexican culture. This year’s exhibit marks 26 years of providing Chicagoans a visual representation of one of Mexico’s most important celebrations. The exhibit will be at the museum until December 16. 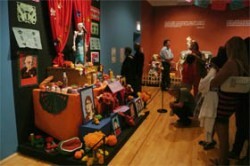 Visit nationalmuseumofmexicanart.org for more information on the Day of the Dead exhibit and museum hours.